That would be great. As I discussed with Ray, I have no idea what a live in-room piano sounds like or where to set my volume to get a realistic level if I should so chose. Since as I understand it you keep things calibrated for all your sessions, all a listener would have to do is make that SPL measurement once, note the level of his control, and be able to return to it a any time. It would be a nice little addition to your path, Truthful Recording and Playback calibrated? Then we developed a specific calibration that turns that "almost flat frequency response" into a "completely flat frequency response". The complete system (the physical setup + the calibration v2.0) has a flat frequency response. So the perfect playback calibration for these recordings would be to play them on a system with a flat frequency response. If it wouldn't be revealing any secrets, what is the approximate distance from the performers to the mic? Sorry if you posted that already, I didn't find it. - Kick drum on drums recording: 8'10"
Thank you sir, inquiring minds just have to know. We have given out 17 albums. 9 for Albeniz Iberia, 6 for Cabrera plays Debussy, 1 for Chopin Polish Songs and 1 for Songs of Paolo Tosti. In addition to the Gift Codes we have also received some donations; I want to tell you I am really grateful for that too. Please feel free to post your impressions. Should you have any questions about the recordings, the web page, ...anything, please do ask, I will be happy to answer all your questions. I stood between my speakers (10 feet) and gave my best impressionistic rendition of a howling male operatic tenor, and got 98.7dB peak at the couch. Oh sole mio! Figaro, Figaro! However, I think it justifies my earlier volume selection which someone thought was a bit loud. Hmm... I may need to work on my projection a bit. What was the distance to the vocalists in the studio? Took me awhile to give a response about Mario's downloads here, sorry about that! Listened to all, just on the speakers of the laptop in fairly optimised state, and was very happy with all of them. As Ray commented about the flamenco, the style of music making for this lot was somewhat unusual to me, this was the hardest to "tune into". Overall, a very nice sense of space in all the recordings, thanks for the opportunity to listen, Mario! "You must show that a man is wrong before you start explaining why he is wrong. The modern method is to assume without discussion that he is wrong and then distract his attention from this (the only real issue) by busily explaining how he became so silly." - Bulverism, by C. S. Lewis. You used the rock recording to "tune" your system. All those "little tweaks" you turned on got the rock sample to sound right. Here is the interesting thing; those same tweaks should work just the same on all our other recordings too (the flamenco, the piano, the singers and the drum solo). All our recordings are made exactly the same way. The hall, the recording gear and the calibration are the same. If you are familiar enough with one of the instruments on any of these recordings you can go ahead and use that recording to tune your systems playback. If you get it to sound right, then you can be sure that whatever you did works just the same on the rest of our recordings. Excellent points Mario; you are absolutely right. But here I don't agree. I simply applied all the adjustments to the playback that I had worked out some time ago gave me optimum sound in general for the laptop - and it delivered, yet again. High quality, direct recordings like yours will benefit when the sound is highly complex, as in the guitar distortion mixing with drums and bass, with natural echo - but even the roughest pop recordings, etc, will also sound better. The highest clarity in the playback gives the most satisfying sound in all situations, I've found. Straight, natural recordings like yours have a certain sound, as do, yes, the most twisted commercial recordings - personally, I can live with them all; but, there will be a large percentage of people who will strongly prefer a very natural sound, so here your recordings should find plenty of enthusiastic consumers ! if your adjustments are working for most recordings my guess is you have manage to bring your playback system very close to delivering a flat frequency response. I know our recordings are supposed to work best when played back that way and, on average, all other commercial recordings should have been mastered using flat systems too so that is the best way to ensure you are listening to what the producers intended. I finally have the SPL file. Sorry it took so long. You can use this SPL file to calibrate the volume of your system to the volume of the actual performance. While playing this file, adjust the volume of your system until your SPL meter reads 75dB at your listening point. All our recordings (except for the drums and rock) are recorded with the same level, so once you calibrate you playback system you will be hearing all the recordings at real live level. The drums and rock are 24dB louder than this. If you wanted to get real live levels of the drums and rock you would have to turn the volume up by 24dB. But I would not recommend trying to achieve that volume on your systems for the safety of your speakers. The file is a 40 second stereo pink noise at -20dB. I downloaded the CD version. How was your pink signal recorded, out of curiosity? Both look about the same on an in-room RTA though, without getting out the microscope. Did that. It varies a little. Played Iberia #3. Got a peak of 95.8dBZ here. 116.9 peak dBZ in the first few seconds of Drums #3, which may not have been the loudest part. It did sound like someone had smuggled a drum kit in here. I've pounded the speakers with drums before, uncalibrated, so, had to see... No damages noted. It did light up the amplifiers. I may have been listening to your tracks just a little bit louder before, with the guessing of levels with my own "calibration" based simply upon "match level on CD to level in room" as a personal calibration to check in-room sound versus accuracy to the recordings. Thank you for the calibration. I was motivated to have another listen to those drums - that "muffled" quality that Ray mentions to me sounds more like the natural sound of the kit; with drums, it's all about the transients of the hit from the stick, at least for me - and this has been captured well, to me; the "tightness" of the skin on the drum comes across nicely. Perhaps commercial recordings often "enhance" the sound of the drum, give the instrument echo to shine out more? I can't see speakers being damaged by enthusiastic volumes - I have done this myriad times, hammering even cheap and mediocre drivers very hard, so they deliver tremendous transient "pop". They've all survived, in fact they typically sound much better for it, the suspensions are nicely exercised and stabilised by the energetic excursions. Interesting and very educational, Thank You Mario. In room levels are very much lower than I would have guessed. Setting by ear I would have had them playing much louder. I still owe you a review, I'll get that up soon. Yes, we did record it from behind. The drummer suggested we placed the drums this way so that he could hear the cymbals and drums placed relative to his playing position during playback. I cannot be sure, but I do not think that would be the reason for that "muffled sound" you are hearing. Drums are never recorded this way. Normally you would place different mics on different pieces. That way you would have to ability of eq each piece separately to bring out specific aspect of the sound and hide others. We are not taking away or adding anything, so I think it might have more to do with the fact that you are hearing the "raw" sound of the drums. 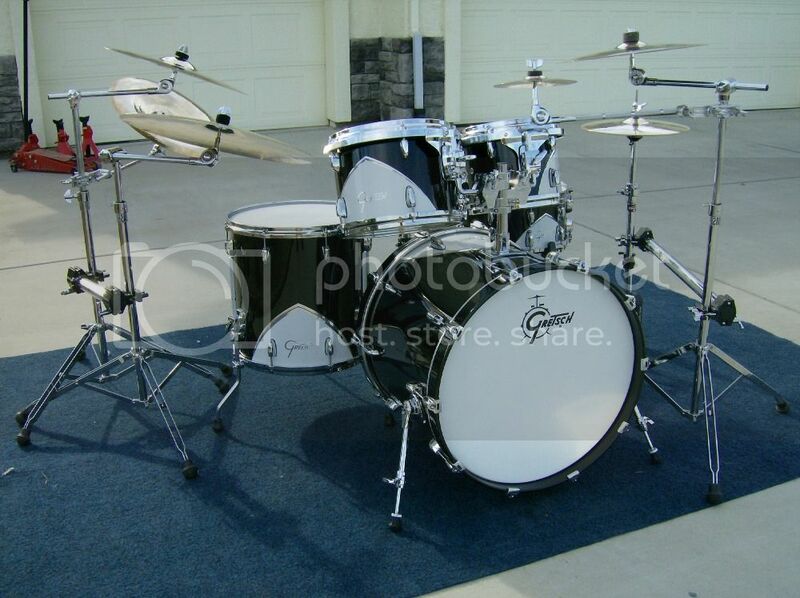 BTW the make of the drums is Gretsch and the model is Renown '57. Listening to the drums again, it is the kick drum that irritates me. Maybe related to the tuning/setup of that drum. My present opinion is it may be tuned a bit high or the resonance control is killing the bottom, and its sound isn't sufficiently distinct from the the low tom. On the other hand, maybe it's just me, or something about my playback. Anyway, your recordings are very good, as are the performers on the albums.